Improved spark plug efficiency with the Sparkmaster, c1953. Homepage. This page: A small but potentially useful motoring gadget, advertised in a leaflet from 1953. There's been no shortage of companies offering spark plugs to garages and DIY-er motorists alike. Products from the likes of Champion, Lodge, KLG and AC have graced the engines of countless cars over the years. So too have gadgets dreamt up by creative minds, to improve the performance of spark plugs, and the ignition system as a whole. Included amongst them are spark "boosters", low-cost screw-on gizmos designed to improve combustion of the fuel/air mixture in the engine's cylinders. 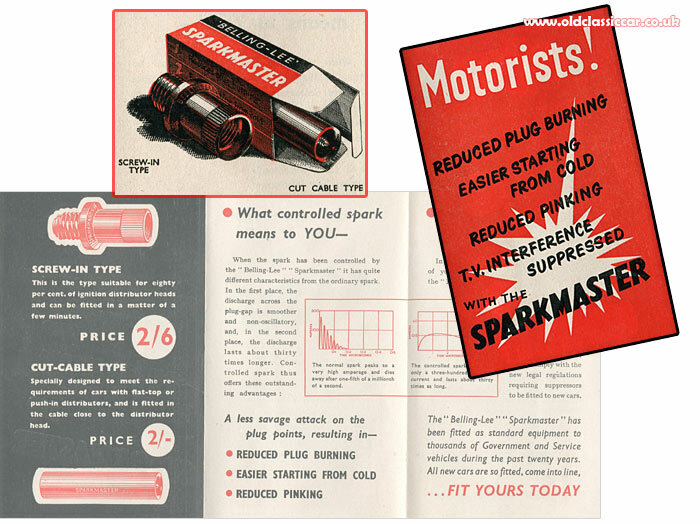 The following leaflet dates to 1953, and promotes the "Sparkmaster", an easy-to-fit add-on whose actual design and workings are not dwelt upon by the copywriter for this leaflet, preferring to focus instead on the alleged benefits of its installation to the car owner/driver. The company behind the Sparkmaster was Belling & Lee Ltd, of Enfield, Middlesex, England, the inventors of the RF television aerial connector apparently (c1922). They were also specialists in the field of suppressing electrical interference in radio transmissions, the motor-car being a key cause of radio interference in the days before widespread adoption of suppressor-type spark plug caps. Suppressing such interference was just one benefit that the Sparkmaster would bestow upon its purchaser, as the leaflet discusses within its pages. This particular ignition booster, like several others produced by rival firms, was designed to be fitted within the main HT lead that runs from the coil to the distributor cap. Two versions were available. One was threaded, so that it could be screwed into the top of the distributor cap, and the master HT lead screwed into it rather than the cap. Where a screw-in HT lead connection was not used, then version two could be pressed into service. This required the lead to be cut, and the unit installed within the lead. Both versions are shown in the above scan. "When the spark has been controlled by the "Belling-Lee" "Sparkmaster" it has quite different characteristics from the ordinary spark. In the first place, the discharge across the plug-gap is smoother and non-oscillatory, and, in the second place, the discharge lasts about thirty times longer." "In addition to improving the performance of your car's engine, sparks controlled by the "Belling-Lee" "Sparkmaster" interfere far less or not at all with radio, television and radar reception. In fact, when fitted with a "Sparkmaster", your car will probably comply or at worst, nearly comply with the new legal regulations requiring suppressors to be fitted to new cars." Whereas the basic Sparkmaster was fitted to just the main ignition coil -> distributor HT lead, further benefits could be gained by using the Belling-Lee "Super Sparkmaster". Here, each spark plug lead would be fitted with its own dedicated unit, so a four-cylinder engine for instance would employ four of these nifty little gadgets, one per lead. Is anyone still running such a device on their classic car today?